Come discover what&apos;s new in the Napa Valley, including new and upcoming experiences, shops, wine tasting, restaurants, and hotels. Napa Valley Bike Tours offers Cycling in the Vineyards, allowing visitors the chance to ride off-road and through private vineyards. 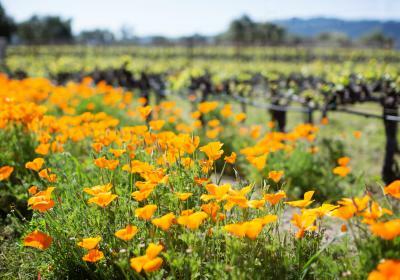 This tour is a unique adventure for visitors who will visit the Carneros AVA, a region famous for its picture postcard views as well its milder-climate varietals such as Chardonnay and Pinot Noir. With a casual pace and frequent stops, the emphasis is on enjoying the scenery and learning about the vineyard growth cycle in an immersive way. The Culinary Institute of America at Copia now offers hands-on cooking experiences for home cooks and professionals in its new 9,000 square-foot state-of-the-art kitchen featuring Hestan appliances. A much-anticipated part of CIA at Copia, the kitchen serves as a hub for public cooking classes, interactive dining events, industry conferences, and private events. Cooking experiences, which range from two-to-five hours in length, include the CIA Skills series, where guests learn basic cooking skills and how to prepare various cuisines from a CIA chef-instructor, then enjoy their prepared meal. Class topics include A Beginner’s Guide to Sushi Rolls, Healthy Cooking, Exploring Brazilian Cuisine, and Grilling Like a Pro. Trefethen Family Vineyards in Napa features Janet Fletcher, author of Cheese & Wine, The Cheese Course and the Planet Cheese blog, who will offer six classes surveying the world of fine cheese in the recently restored tasting room. Classes are offered 5:30 to 7:30 p.m. each Thursday evening April through September 2018 and begin with a half-hour reception, followed by a sit-down wine and cheese tasting. The Lincoln Theater in Yountville offers a new Americana Series, which will feature folk, bluegrass and rockabilly concerts. Kicking off their “Speck Tour” at the theater is Billy Bob Thornton & The Boxmasters on July 6, 2018. On Aug. 8, 2018, Reds, Whites & Bluegrass features Bay Area bluegrass bands for a family-friendly outdoor event, including wine and food trucks. On Sept. 8, 2018, acclaimed performers from Elko, Nevada&apos;s National Cowboy Poetry Gathering perform. Verve Napa Valley provides an insider’s tour of Napa Valley and the women behind the wine. Go behind the scenes to meet a few of Napa Valley’s most inspiring women leaders and winemakers. This exclusive Women of Wine (WOW) tour is hosted by Verve Napa Valley owner T Beller, who was recently profiled in the book Wine Country Women of Napa Valley, a celebration of our region’s most prominent and accomplished women. The tour includes a Sabrage demonstration and lunch. Rooted Fork Foodie Tours, Napa&apos;s locally owned and operated walking food tour company, has launched its inaugural Downtown Napa Brunch Tour. Guests will experience the chef’s signature dish, accompanied by a brunch beverage, at seven popular brunch locations in downtown Napa. The tour is offered each Saturday 10 a.m. to 1 p.m. Pure Luxury Transportation offers The Art of Winemaking, which provides the experience of being a winemaker for a day while sipping wines at three Boisset wineries. The Bijoux: Jewels of the Valley tour includes visits to three locations, including the JCB Lounge at The Ritz-Carlton, San Francisco. First Street Napa has announced several new retail merchants, including: Tommy Bahama, an island-inspired lifestyle brand that defines relaxed, sophisticated style in men’s and women’s clothing and home furnishings; Mecox, offering a range of products suited to indoor and outdoor living environments; State & First by Maris Collective, offering curated women’s and men’s fashion, footwear, handbags, accessories, and home goods; Lush, offering skincare, hair care and bath products, as well as unique gifts; Napastäk, a chic, unique epicurean boutique featuring an eclectic selection of high-end cooking products; and Kalifornia Jean Bar, featuring the latest California fashions for men and women, and premium brands for denim and accessories. Sofie Contemporary Arts gallery opened in Calistoga in late 2017. The gallery’s vision is to offer unique contemporary works of diverse media, each connected to California in some way, and address all types of content, subject matter and approaches. Created by artists at varied stages in their careers and lives, exhibited works are often locally or regionally sourced. Monastery Books & Gifts opened in August 2017 in downtown Calistoga and features pure honey, homemade goodies, olive oils and balsamic vinegars, premium loose-leaf teas and distinctive gifts, including children&apos;s books, icons, religious books and gifts and hand-crafted items. Beaulieu Vineyard in Rutherford now offers a Heritage Tour and Library Tasting, featuring a tour through the winery’s newly established Reserve Winery where guests see firsthand where the Georges de Latour is crafted. After the tour, guests are guided through a flight of the Beaulieu Vineyard’s finest Library Wines, hand selected from its winemaking team, with the opportunity to taste aged Cabernet Sauvignon. The tour is available Friday through Sunday at 10:30 a.m. and 1:30 p.m. Reservations are required. Burgess Cellars in Calistoga debuted its Mountainside Tasting, a seated, semi-private tasting experience in the Mountainside Tasting Room with panoramic vistas of Napa Valley. Guests experience selections from the 45-year Burgess Cellars Library Program, including small production rare wines and current releases. This tasting is 90 minutes and is offered daily at 10 a.m. and 2 p.m.
Provenance Vineyards’ seasonal Out of the Box tasting experience, which will re-launch in May through October 2018, includes the classic Ambassador Tasting paired with a picnic lunch from Bouchon Bakery. A vegetarian lunch option is also available. Bouchaine Vineyards in Napa allows three new wine tasting experiences. The Falconry Vineyard Tour allows guests to join an expert falconer and learn about winery ecological practices as falcons and owls literally fly from guest to guest in the middle of the vineyard overlooking San Francisco Bay. A Sunday Morning Vineyard Walk allows wine club members and guests to embark on a self-guided path through the vineyard; and the Evening Barrel & Sunset Tastings begin with wine tasted from the barrels and culminate with 360-degree views of wine country and the San Francisco Bay. Each experience is available by reservation. Etude Wines in Napa now offers a Cabernet Focus Tasting, featuring Cabernet Sauvignons each representing sub-appellations of Napa Valley. The winery’s vineyard blocks are carefully selected so each wine reflects the distinct attributes of each district. Guests will enjoy a flight of five signature Cabernets (including library selection), each from the Napa, Saint Helena, Coombsville, Rutherford and Oakville AVAs. Tastings are conducted in a semi-private room overlooking the winery below and include a food accompaniment and brief tour. Tours are offered daily 11 a.m. and 2 p.m. Reservations are required. Stags’ Leap Winery offers the seasonal Winemaker’s Apothecary Garden Experience tasting set in the property’s outdoor garden recently revitalized by the Stags’ Leap winemaking team and noted landscape designer, Jonathan Plant. Guests will learn the history of the property, stroll through the garden experiencing the aromas that are reflected in the wines, and experience a seated sensory tasting featuring aromatic elements selected from the garden and Stags’ Leap estate wines. Tours are offered daily at 11 a.m. and 2 p.m. Reservations are required. Jamieson Ranch Vineyards offers Chef’s Table, an opportunity for guests to interact directly with Winery Estate Chef Scott Ekstrom, who will be in the tasting room 1 to 3:30 p.m. one Sunday each month to discuss and share special bites paired with a featured wine. Mini-Moments is a unique, interactive experience with the winery’s family-friendly therapy horses. Guests may interact with the mini horses, followed by a seated signature tasting of five Napa Valley wines. Bottle & Blanket, offered this spring and summer, provides visitors the opportunity to purchase a bottle of wine and picnic basket to enjoy on the winery lawn, with views of the vineyards, rolling hills and the San Pablo Bay. Robert Mondavi Winery in Oakville announces the new Piccolo Garden Picnic Lunch, available each Friday, May through October 2018. Upon arrival, guests are greeted with a splash of Fume Blanc before a stroll in the renowned To Kalon Vineyard and fermentation cellar. Lunch is served in the Piccolo Garden and includes a choice of sandwich or salad, a side, dessert and a taste of two signature wines. Fairwinds Estate Winery in Calistoga offers A Taste of Calistoga. Guests will walk through the winery’s 22,000 square foot wine cave to the intimate alcoves for a wine tasting from four Calistoga wineries, including Fairwinds Estate Winery; Valley Floor Vineyard; Kenefick Ranch; and Canard Vineyard, paired with house-made charcuterie. The tasting is offered daily 10:30 a.m. to 4:30 p.m. The Sky & Vine Rooftop BarSM opened at Archer Hotel Napa in the center of downtown Napa on April 15, 2018. The expansive 7,000-plus square-foot destination rooftop is home to chef Charlie Palmer’s second outpost on property, a full-service restaurant and bar that serves breakfast, lunch, dinner, and Sunday brunch, as well as late night bites and cocktails. Sitting atop the five-story structure, the Rooftop offers 360-degree views of Napa Valley and includes fire pits surrounded by modern rocking chairs, a shallow ledge pool, cabanas with stone fireplaces, and indoor/outdoor fitness studio and spa. Gran Electrica, the second outlet of the original in Brooklyn, NY, has opened on Main Street in downtown Napa, offering an authentic and market-driven Mexican menu. The beverage program incorporates traditional flavors with seasonal ingredients, and cocktails featuring tequila and mezcal by small-batch and artisan distillers. The restaurant&apos;s wine cellar features a selection of both local and European wines with a focus on small producers. Gran Eléctrica Napa also offers a large outdoor patio, perfect for al fresco dining alongside its chef-driven produce garden. Lovina (formerly Calistoga Kitchen) recently opened in Calistoga. Lovina was once the home of Lovina Graves Cyrus and John Cyrus, Calistoga pioneers who survived the Donner Pass in 1846. The team at Lovina is a diverse group of friends, uniquely suited to running this small, historic restaurant space. Napa Valley Heritage Catering opened in March 2018 to offer “bounty of the season”-inspired menus that include whole animal cookery, canapes, sommelier wine-paired dinners, reservation-only chef’s table dinners, and buffet menu items. The concept is a culmination of passion for food and raising heritage pigs. Acacia House by Chris Cosentino at Los Alcobas Napa Valley now offers a happy hour Sunday through Thursday 4 to 6 p.m. Guests can experience the best of Acacia House Restaurant with the happy hour menu featuring $5 bites paired with $5 bubbly or their Grandview Homebrew beer. Archer Hotel Napa, a luxury boutique, new-build hotel in the center of downtown Napa, celebrates the debut of its expansive 11,000-plus square-foot destination rooftop. The alfresco space is home to chef Charlie Palmer’s second outpost on property, Sky & Vine Rooftop BarSM, a full-service restaurant and bar that serves breakfast, lunch and dinner, as well as late night bites and cocktails. Sitting atop the five-story structure, the Rooftop offers 360-degree views of Napa Valley and includes fire pits surrounded by modern rocking chairs, a shallow ledge pool, cabanas with stone fireplaces, and indoor/outdoor fitness studio and spa. The Francis House in Calistoga is slated to open July 2018. Initially a family home for prominent local merchant, James H. Francis, The Francis House is a landmark building steeped in history and prestige. Built in 1886, The Francis House is listed in the National Register of Historic Places and is being carefully restored, rehabilitated and redesigned as an exclusive five-room luxury inn. Bardessono Hotel & Spa in Yountville has partnered with the Andrea Schwartz Gallery of San Francisco to feature contemporary, up-cycled art installments throughout the hotel and in guest suites, offering guests the opportunity to enjoy the finely curated pieces and purchase at will. Installments are updated each year and refreshed as pieces are sold to offer a continuously updated exhibit. An add-on wellness treatment is now available at Solage, an Auberge Resort. Somadome is a personal high-tech wellness pod providing a sanctuary in the privacy of a pool cabana. Guests can quiet their minds and reap the benefits of a customized, 20-minute guided meditation session, all while comfortably immersed in a dome of light.